What are the ways to import presentations? You can import pdf presentations as well as videos and images via Email, Dropbox, iTunes shared folder or download presentations from the internet to the Presentation Viewer. Can I open presentations from Email? Yes, PDFs can be opened directly from the iPad’s Email program. Download the attachment and press “Open in” Viewer. A new presentation will be created in the Presentation section of the app. How can I import other media such as videos or images to Presentation Viewer? 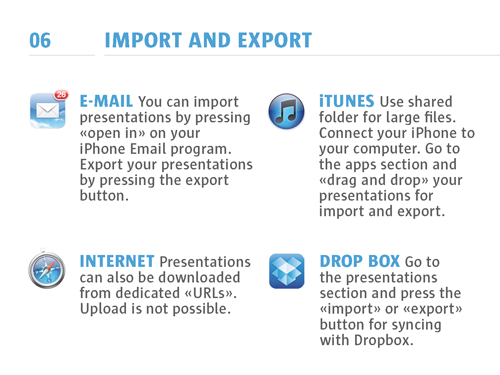 You can import other media also via Email, Dropbox and Co. However imported media such as images or .mov videos will appear in the Inbox situated under the Plus button in the Edit mode. From there you can incorporate media into your existing PDFs. How can I import presentations using iTunes Shared Folder? You need to connect your iPad to your computer and start iTunes. Then select your iPad and go to the apps tab. At the bottom you will find the shared folder. Select Presentation Viewer and drag your documents into the folder. The iPad will synchronize automatically and you will find your presentation in the Inbox situated under the Plus button in Edit mode. Can I import presentations using Dropbox? Yes, you can easily sync your presentations with your Dropbox account. When downloading a PDF from Dropbox it will open directly as a new presentation in the Presentations section of the app. 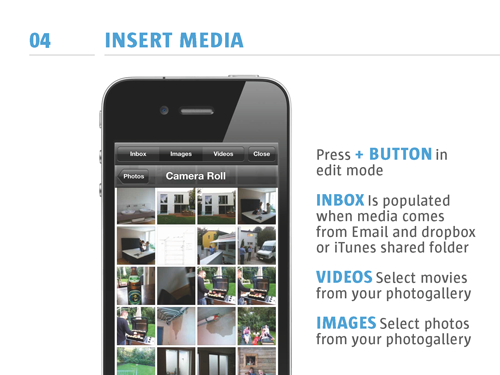 Other media such as videos and images will be saved to the Inbox situated under the Plus button in Edit mode. How can I download presentations from the internet? By pressing the download button in the Presentations section and selecting from Internet the in app browser will open. Navigate to your presentation and press the download button when you have opened it. The presentation will be saved right in the Presentations section of the app. How can I add additional media? Go into Edit mode of a presentation and press the Plus button. Here you can add videos and images as well as documents you previously downloaded and saved in the inbox. How can I change the rotation of the slides? Press on the tool icon on the topbar and and then select the slides you want to change the rotation. You can also select multiple files. Then press on the rotate button. How can I change the order of the slides? 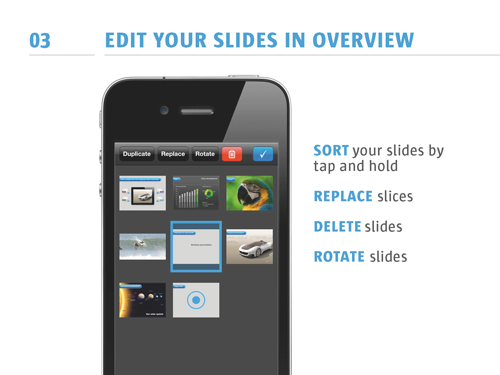 Press the Overview icon and tap and hold on the slides you want to move in your slideshow. Then place them by drag and drop to the desired position. How can I delete selected slides? Press on the tool icon in the topbar and select the slides you want to delete. Then press delete button. How can I show presentation in full screen mode? Just press on the Play button in Edit mode and you will be able to see the presentation in full screen. 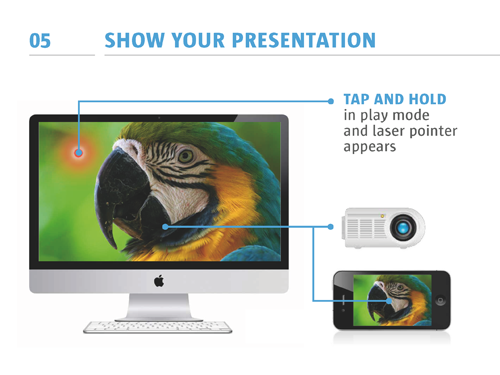 With an HDMI cable or am Airplay ready screen you can also share your presentation with a larger audience via an external screen. How can I activate the laser pointer? Simply tap and hold with one finger in play mode and the laser pointer will appear on the iPhone screen as well as the external screen. How can I swipe or tap through my slides? In the Presentations section under the More button you find two options which can be used to navigate through the presentation. You can either swipe or you can tap. When swiping you will get a swipe transition. When you tap your slides will show up immediately without the swipe effect. What types of presentation formats are supported? Presentation Viewer is optimized for pdfs, images and videos. You can also show Keynote and Powerpoint presentations by saving them as pdf files or images and import them onto your iPad. Does Presentation Viewer support Powerpoint and Keynote presentations? Presentation Viewer is not optimized for Keynote and Powerpoint files. However, simply print your Powerpoint and Keynote presentations as PDF files or images and import them onto your iPad. In this way you can also show these file types. Yes, you can incorporate videos. Often it makes sense to sync your videos via the iTunes shared folder or Dropbox due to the size. The videos will then appear in the inbox situated under the Plus button in the Edit mode. From there you can insert the video into your presentation.